At ezFoodFest Atlanta, LJ shared her views on catering customer service, from starting to building your catering business. All while launching a new corporate catering dish. Here, LJ reveals what makes a good caterer, and to how to build and retain your customer base with customer service in mind. So, what makes a good caterer? What skills do you need? When delivering a catering order, timeliness is crucial. Be familiar enough with your delivery area to avoid traffic without using a GPS. Knowing the most efficient route to your destination is invaluable. “Everything is about the little details. Every little thing. It makes a big difference.” Unlike in a restaurant, with a catering order, you can’t send food back if you’re unhappy. This means customers are more likely to share their disappointment with others. You may not see a return order if there is a mistake, and you lose referrals. “You have to enjoy people and be willing to work with them. Especially the lady or the man in the office placing the order.” Make their life as easy as possible and make them look good. It’s their job on the line. What techniques have you used when building a catering business? LJ even markets in her personal life. “I’ve got my cards on the back of my phone. Everybody’s got birthdays, graduations, they’ve all got personal things.” You never know who will need catering at work too. Retention is built on creating relationships and catering customer service, which LJ finds to be the differentiator for Bridge Catering. This means listening to customer’s needs, checking they have everything, and always following through. Plus remembering birthdays, anniversaries, and any other life events her clients have. But she doesn’t stop there. LJ starts each Monday with a text to every large company in her contacts. Each text wishes her contact a “good work week” and checks on their catering needs. She says, “it does two things: it starts them off on their work week and it reminds them of me,” keeping them happy and coming back for more. Looking for more advice on building a catering business? Read Portrait on a Plate’s tips for opening a catering business. Start gaining incremental catering orders today. 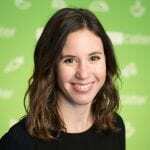 Sarah Gurr is the Head of Content Marketing for ezCater. After managing digital marketing for pizza and sandwich chains, Sarah now focuses on providing insanely helpful information to ezCater’s customers and partners. When she’s not managing the ezCater blog, she’s baking new recipes and trying new restaurants in and around Boston.